Q COSTA RICA – All visitors and foreigners living in Costa Rica should take precautions against the possibility of heavy rains, strong winds, flooding, and mudslides throughout Costa Rica as a result of Hurricane Otto. Otto is currently located east of Puerto Limon in the Caribbean Sea and is approaching Costa Rica and Nicaragua. It is expected to make landfall by Wednesday night (November 23). 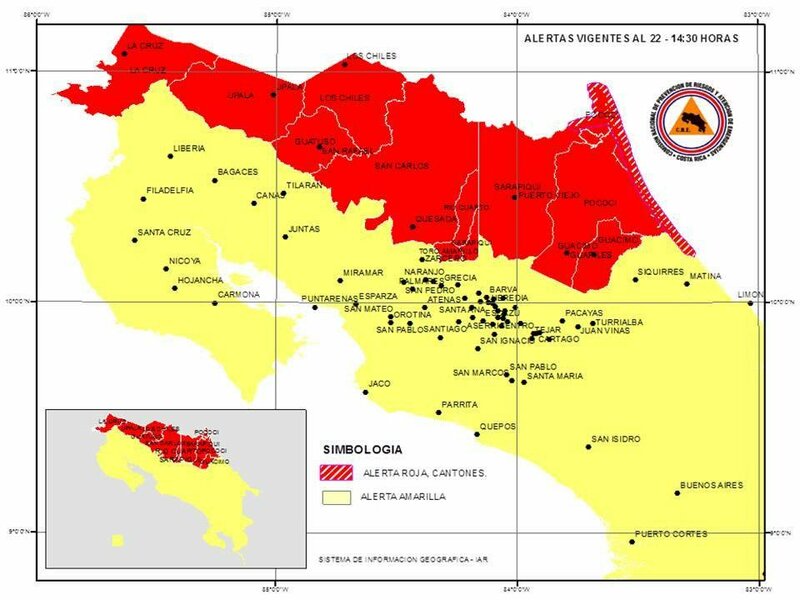 Costa Rica has a three-level warning system (Green, Yellow, and Red), and the Costa Rica National Emergency Commission (Comision Nacional de Emergencias, or CNE) reports that a Red alert (the highest) is in place in Costa Rica’s Caribbean region and northern zone. A Yellow alert is in effect for the rest of the country. Tuesday morning (November 22) the government ordered the mandatory evacuation of the northern Caribbean region. These areas include Tortuguero, Barra de Parismina, Boca Tapada, Boca Pacuare, Barra del Colorado, and Calero. Visitors are advised to avoid these areas. Caution should be exercised in all other areas, as the hurricane may affect the entire county for several days as roads and river condition may worsen. Travel should be limited to the Central Valley area as of today (Wednesday) and through the weekend. Be advised to monitor local media for updates or possible changes to weather conditions and to follow any instructions and/or warnings. Preparations to protect life and property in any storm or weather-related event should be considered. Foreigners visiting the country should carry their travel documents (i.e. passport) with them at all times or secure them by placing them in a safe, waterproof location. If you must travel during this time, please take reasonable precautions such as avoiding entering swiftly moving water. 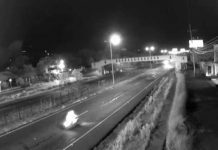 Drivers should remain vigilant for possible landslides, flooding, and reduced visibility, particularly in mountainous areas. Due to the potential severity of the storm, power outages are a possibility, and communications systems, including cell phones, may be affected in certain areas. 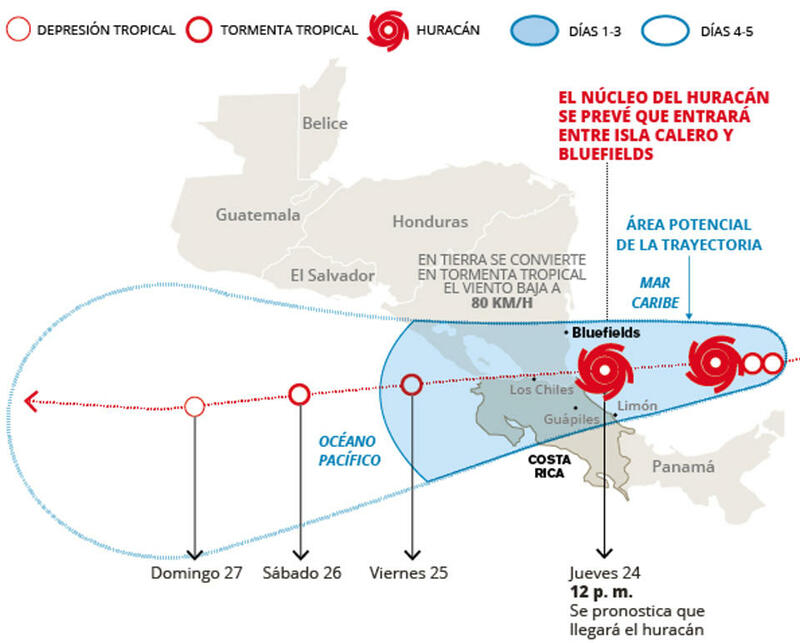 To follow the storm’s path and follow updates, please visit the National Hurricane center website (http://www.nhc.noaa.gov/gtwo.php?basin=atlc&fdays=2 , the Costa Rica National Emergency Commission (CNE) website http://www.cne.go.cr, and the CNE Facebook page https://www.facebook.com/CNECostaRica/. The Costa Rica National Meteorological Institute (Instituto Meteorologico Nacional, or IMN) provided specific information is also available on the Twitter feed https://twitter.com/imncr?lang=en. For the status of roads, which can change frequently, please consult the transit police website http://www.transito.go.cr/estadorutas/index.html. The U.S. Embassy in Costa Rica warns U.S. citizens traveling to or residing in Costa Rica enroll in the Department of State’s Smart Traveler Enrollment Program (STEP). STEP enrollment gives you the latest security updates, and makes it easier for the nearest U.S. Embassy or Consulate to contact you in an emergency. If you don’t have Internet access, enroll directly with the nearest U.S. Embassy or Consulate. In addition to information on the Internet, travelers may obtain up-to-date information on security conditions by calling 1-888-407-4747 toll-free in the United States and Canada, or outside the United States and Canada on a regular toll line at 1-202-501-4444. These numbers are available from 8:00 a.m. to 8:00 p.m. Eastern Time, Monday through Friday (except U.S. federal holidays). The U.S. Embassy in San Jose (telephone number: 2519-2590) will be closed for regular business on Thursday, November 25 in celebration of the Thanksgiving holiday. 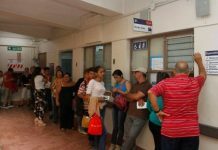 If you are a U.S. citizen in need of urgent assistance outside of business hours, the emergency after-hours number for the U.S. Embassy is 2519-2000. The Canadian Embassy in Costa Rica through Global Affairs Canada advises against non-essential travel to the east coast of Costa Rica due to Hurricane Otto. See Natural disasters & climate for more information. Canadians seeking emergency consular assistance in the area should contact the Embassy of Canada in San José or the Emergency Watch and Response Centre in Ottawa. The Canadian Embassy in Costa Rica is located in La Sabana, behind the “Contraloría” in the Oficentro Ejecutivo La Sabana Building 5, Third floor. This is the first time Costa Rica is facing a hurricane to landfall. 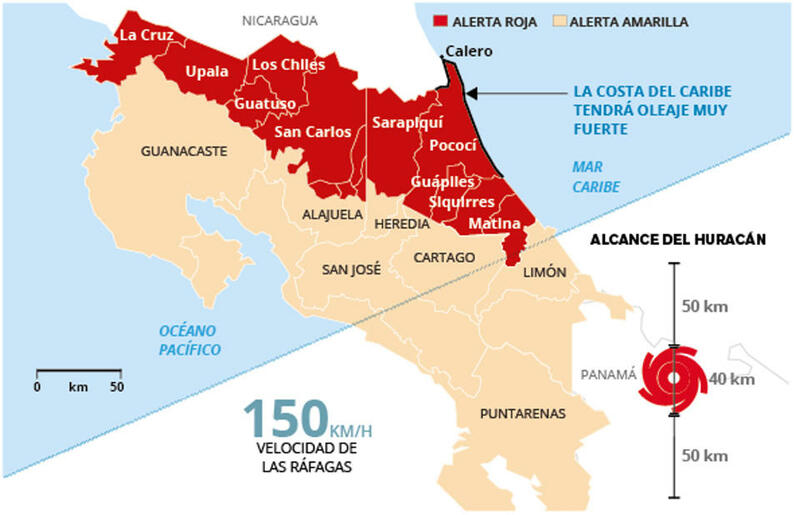 Juan Carlos Fallas, director of the IMN, said “Costa Ricans (Ticos) have no experience in handling the wind force expected for Wednesday night and early Thursday”.